Communication and on-vehicle control modules continue to shrink in size. New products are frequently launched, and ceramic substrate manufacturer Z Inc. was challenged to improve performance and reduce costs with each new product release. With a delivery date only two months away, can Z Inc. achieve both low cost and high quality? One of its clients, a control module manufacturer, requested Z Inc. to produce ceramic wiring substrates for use in its new products on the condition that delivery times be shortened and prices be reduced more than ever before. In addition, because the client needed to release the new product within three months, Z Inc. was given a timetable of less than two months. Under such tough conditions, the Design Department of Z Inc. attempted to create prototypes using the currently used materials. However, further cost reductions for the new substrate were impossible when the required performance was taken into consideration. After a series of trial and error tests, Z Inc. came up with the idea to replace the thick film paste used as the wiring material. 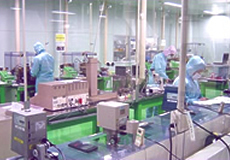 Although inexpensive pastes of moderate quality were available, offering such pastes would lose the trust of the control module manufacturer and also lead to the failure of the new product. For these reasons, a person in charge at Z Inc. decided to find a different low cost thick film paste capable of meeting the client’s requirements. First, he consulted with the company’s suppliers, but none of them offered a product satisfying the necessary conditions. Next, he attempted to get information from his peers as well as from the Internet without encouraging results. Just as he found himself at a loss and beginning to seriously worry about meeting the delivery date, he received an e-mail. The hurdles of cost, quality, and delivery have been cleared with a broad lineup of products and a proven track record of deliveries. That e-mail was sent from Tanaka Precious Metals Group. Although the person in charge was not yet familiar with the sender, Tanaka Precious Metals Group produces and sells thick film pastes made mainly from precious metals. The group has a rich lineup of thick film paste materials and a proven track record of providing such materials. He was impressed with Tanaka’s wealth of thick film paste materials know-how and recipes in addition to the characteristics of its precious metals, and he hoped they would be able to suggest and quickly deliver a thick film paste meeting Z Inc.’s requirements. 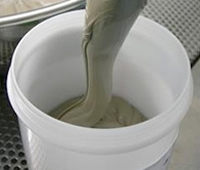 Tanaka Precious Metals Group quickly suggested some ready-made paste products from its extensive product lineup which were capable of clearing the cost requirement due to the company’s integrated manufacturing beginning from powders. Despite his hope for a solution to the challenges, the person in charge at Z Inc. was still concerned about whether the fired ceramic substrate could meet the specifications and had yet to reach a decision. It was then that he was invited to take a factory tour. Upon being invited to test samples at the plant, he visited the plant and learned that one-third of the employees on the production and design lines were dedicated development specialists. These specialists helped him find the optimal paste by firing several thick film pastes on the substrate samples and testing whether they met the conductivity, heat resistance, and other performance criteria. After confirming that one of the pastes met the requirements perfectly, the person in charge at Z Inc. immediately ordered that thick film paste from Tanaka Precious Metals Group. When Z Inc. placed an order for the paste, the Tanaka Precious Metals Group sales representative explained that the company recommended ready-made products because of the tough delivery and cost requirements for that particular project. However, the representative noted that the company could also offer higher quality products by developing custom thick film paste products. Tanaka Precious Metals Group has a wealth of product knowledge and many development specialists to support customized products. The person in charge at Z Inc. felt that Tanaka will suggest the right combination of customized and ready-made products in his future product development projects. Due to Tanaka Precious Metals Group’s proposal, Z Inc. was able to deliver its ceramic wiring boards within the scheduled short delivery time of only two months. According to Z Inc., its client, the control module manufacturer, also was very satisfied with the boards in terms of both cost and quality as they were able to launch their new product successfully according to plan and are now enjoying large sales. Which plant offers a broad lineup of customizable thick film pastes?